Submitted by rogueknight333 on 2014-09-20 18:35. You are a bounty hunter who has pursued a dangerous criminal into the frozen north. Aside from a small hunting lodge, all civilization has been left behind. Your quarry is hiding somewhere in this snow-bound wilderness filled with dangerous beasts, savage orc tribes and perhaps worse, but where? This is a module originally made for the February 2013 Adventure Building Challenge, in which participants were challenged to make a complete module in only a month,and is now made available on this vault. It is a short module that could be completed in several hours of play, and is intended for PCs of Level 11-14 (if necessary, there is a level-up utility at the start that can set you to the expected level and provide appropriate gear). All classes, races, and alignments are playable. See the readme below for more information. The storyline was, well, not so original, but the atmosphere more than made up for it. Took me around 3 hours to finish the module ; an afternoon well spent. Thanks for commenting, Noobzor. Given the nature of this particular project, it was hardly going to have a complex and epic plot, but I am glad you enjoyed what it did offer. I have palyed with 13th level ranger and had fun. For some reason I got 5 or 6 scimitars +1.. while I was using either longbow or rapier/dagger dual-wield style. Mayhaps I had no favourite weapon feat. One typo in OOC area with the blue ball: "perhpas"
Thanks for voting and commenting, Werelynx. I was wondering if anyone would notice the little joke with the name. If you have taken any weapon-specific feats there is a script that at a certain point will insure you get a powerful magical version of that type of weapon, but will just default to some basic type if you have no such feats. Likewise there are some randomized treasure drops that just select among a limited number of possible items (I did not bother to set them up for every possible weapon). This probably accounts for the superfluity of scimitars you received. It would be nice to check also for "weapon finesse" feat, which is also (somewhat) a weapons specific feat, right? I've just started, so not sure how "divine luck" (as in, by the forces of destiny, you happen to find _exactly_ the weapon you have a focus in, in every two chests you inspect) will have a play in the success/failure of the main quest. I'm positive that it will be fine anyway. I'm playing a dex ranger/rogue/shadowdancer with specifically no specific weapon feats. I want her to be able to wield the broadest range of weapons (so just got exotic proficiency at level 9)… of course, finessable or ranged with much more effect than, say, a greatsword.Will get Called Shot at level 12 (works with all weapons) and Point Blank Shot at 15 (all ranged except crossbows). I like versatility. At any rate, for what I saw up to now (first cave and first part of the snowy forest north) it is truly visually beautiful, low-magic and kind of perfect for a ranger (animal empathy comes in very useful already). Good work! Knowing the author from Swordflight, I'm sure I won't be disappointed, except maybe for a "It's not long enough!" feeling. I generally do check for Weapon Finesse in the scripts I write to provide feat-specific weapons, so if you have that feat, and explore thoroughly, you should at some point get a good weapon that benefits from it, although this might in some cases be complicated by the fact that some creatures who drop customized weapons might only be wielding those of medium or large size which would mostly not be finessable. I hope you will indeed not be disappointed, though this is a short and relatively simple module, on which I did not spend nearly as much time as on Swordflight. Thanks for voting and commenting, Cave Gnome. I am sometimes amazed myself that this module turned out as well as it did given the time constraints. Doesn't need SixesThrice Tilesets unless they were already in my hak folder. It mentions Winter Wildlands, which is actually available from this link. The one currently linked has Six's other tilesets. Like Turkeys said, the tileset it actually needs is Winter Wildlands, which it seems you did in fact already have in your hak folder. Apparently some of Six's tilesets were reorganized at some point after I had uploaded this, and that tileset got shuffled to a different page. I have now fixed the link so it points to the correct page. I've played this wonderful winter-land mod for the 2nd time, and recounted it starting here. 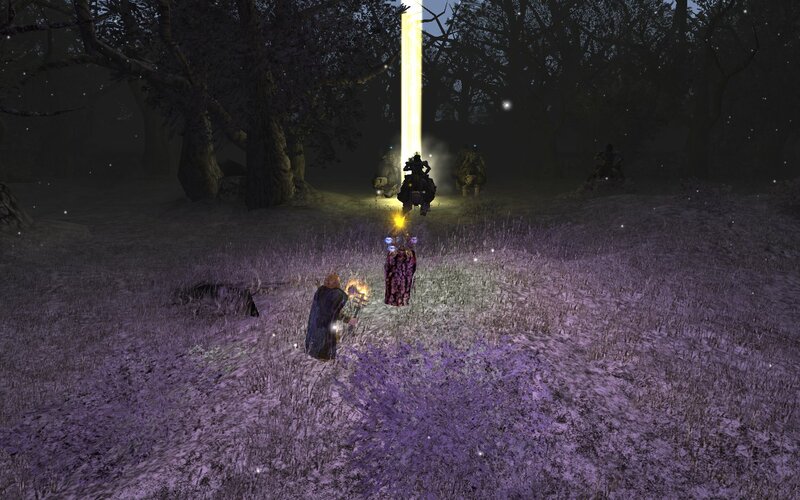 Snow Hunt is a great five hour adventure that includes an intriguing main quest, custom itemization, two solid sidequests, custom mob/boss encounters, alignment shifts, XP scale adjustment for the Henchman, well-written dialogue with lots of checks based on the character, a level-up utility, a tracking mechanic, secret doors, traps n locks, implementation of community-made tilesets/placeables, plus the ending can play out in two different ways and it has solid replayability - all in a month's work? Thanks your vote and comment here, Lilura, and especially for the more detailed review on your blog. I love snowy modules! And this is a wonderful adventure, in terms of "short module" category one of the best I played. It is polished and well made, comparable to Heart of Winter (which uses less custom content but presents more diversified areas & longer plot). I was amazed how the author of the module was able to breathe the life in this harsh icy wilderness with his use of winter tilesets and photopgraphy-like loadscreens (at some point I had an impression they must have constitued an inspiration for the tilesets, as there is some similarity). You could really feel like a seasoned wanderer, especially in the central snowy plain with a couple of lonely trees on the horizon. I also gladly noticed that the "walls" made of trees are in fact partially transparent so that you can look through the branches of the trees if there is some traversable space behind. A unique effect, I did not find anything similar anywhere else in NWN modules. So... I give 9/10 because it is too short ;) RogueKnight, I would be more than happy if you used this tileset (btw. a tileset for a town looks beautiful as well) in subsequent installments of Swordflight. Cheers. Keep in mind I did not make any of the tilesets, loadscreens, etc. myself, I just used them. Since you liked the CC so much, perhaps you would consider voting on that as well (links to it are above, naturally). "So... I give 9/10 because it is too short ;)"
EDIT - Btw, I have played this through four times now, most recently as a Shifter (it was pretty hard, but I'm not so good at building them). I played it with a Level 7 Ranger/Level 5 Rogue PC and finished it within 4 hours. An IMPRESSIVE mod considering the amount of work done in so little time. A keeper! Keep up the good work mate! Thank you for the vote and encouragement. Finished this today in preparation for playing the same author's Swordflight series. Enjoyable little romp. 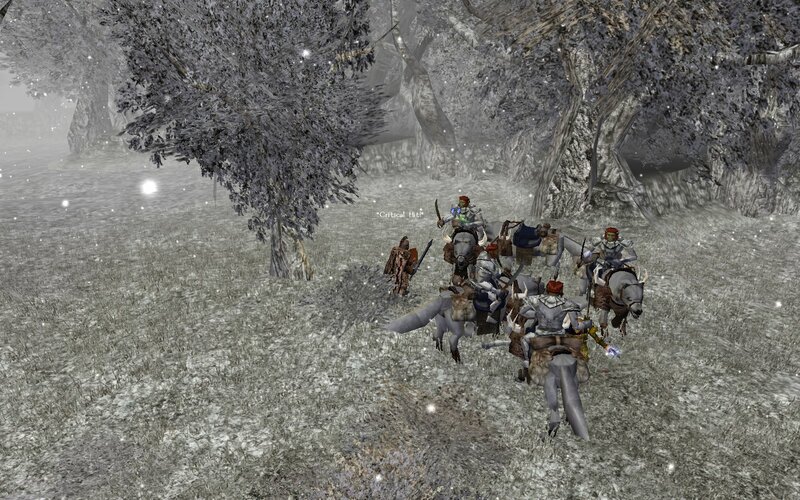 Loved the snowy venue, the orcs mounted on polar bears, etc. 8/10. Thanks for commenting. I hope you enjoy Swordflight as well. I just wanted to add another vote to this great mod! I imported my Lvl12 Paladin/2 Fighter, and enjoyed the whole adventure. Thanks for the vote, Neilyum. I'm currently playing through this module with a level 12 Druid. So far, I really love it. The use of custom content was genius. Also, props to the builder for implementing some "goodies" for the treehuggers - something sorely lacking in many NWN modules. However, there is one issue that might be a bug. 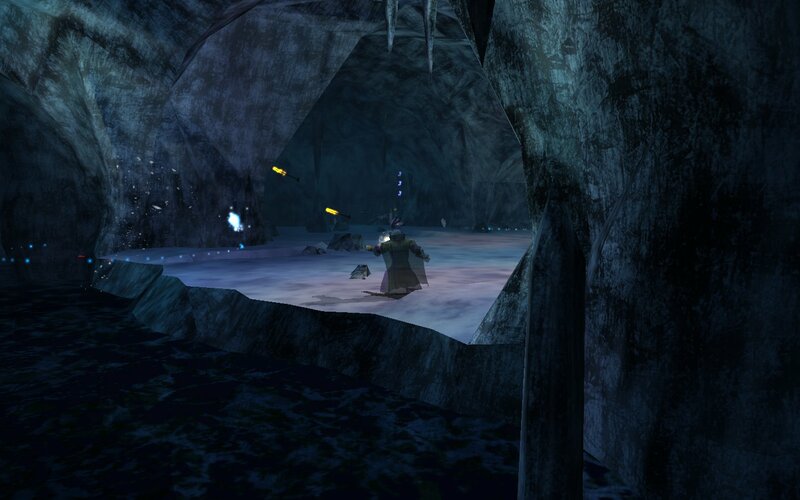 I have already cleared out the Icy Caves in the West Forest and spoken to the Ogre Mage in the East Forest, but I still cannot open the big locked door in the Icy Caves. Is there something else I have to do first before it will open? Glad you are enjoying the module. I try to include lots of class-specific features in my work. If you mean the large door in the "Icy Cave - West" area, this can only be opened if approached from the eastern side. 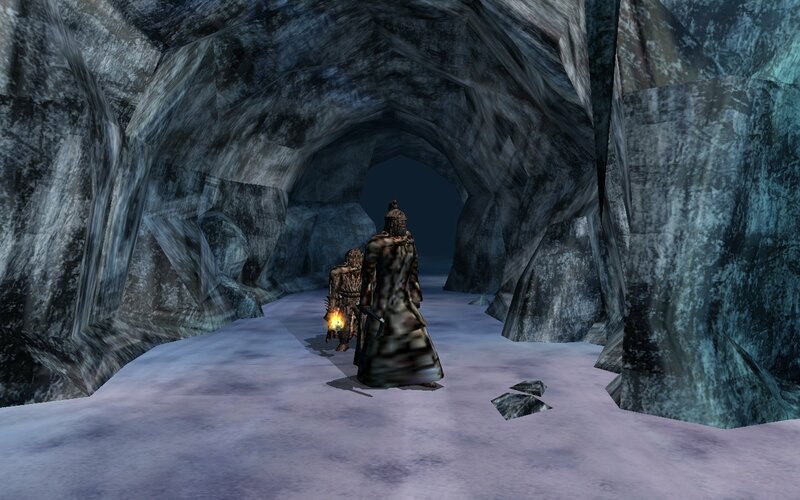 Start from the area in which you met the Ogre Mage, and travel from there westwards through various areas of the cave complex, and you should reach it. You will find piles of snow on the eastern side of the door, interact with them to trigger a conversation allowing you to clear them out of the way and render the door openable. If you have already reached the door from the western side, you will have completely explored this cave complex in any case by the time you reach it from the east, even if you are for some reason unable to open the door. If you mean the smaller door in the south of this area, that can only be opened by casting a specific spell on it, and generally will not be openable by anyone but a mage. I give it 5\10. Way too short and feels like a demo. I don't know whether it's me but it also felt like on rails a little. i was following the tracks and found Bad Guy very fast. While it started nice the ending pretty much ruined it for me. Main bad guy, i didn't bother to remember his name because there was pretty much nothing about him other that being bad guy. So i'll call him "Bad Guy". Bad Guy was cabale of fooling pc using illusion, but then you track him down and he just waits to mindlessly attack you at the hunting lodge like an idiot? What was the point? Feels like an mmo quest. Nice use of tilesets i guess, but for a short module like that... why? Vanilla tilesets would be enough. Way too many haks to download for 1-hour long module. But don't take my words too hard. It's not a bad module, i've seen worse. And at least you can write dialogues properly. Keep up. Make something better. I'm sure you can. Yes i did, took me 1 hour or 1 and half to complete. I wasn't running through it and just played at the normal pace. So i was surprised at how fast i got to the point where i can end the module and export my character. Thanks for commenting, Sea (and thanks for defending me, Balisong). If you read the module description you will know that it was made in only a month in response to a challenge, and is specifically advertised as being very short, which might be an advantage for players with limited time. At any rate I certainly acknowledge that it is probably not my best work and has some demo-like features. If you would look into my Swordflight series, you would see that I actually am making something at least arguably better, and certainly something that is at the opposite extreme from this in terms of size and scale. I heard about Swordflight. Didn't know you're the author. Someone actually recomended me to play these modules, so they are on my playlist. One of the most appreciated features of the module is that I can play with a mid-level PC...I liked it very much...now, time to play Swordflight 3! Thanks Aquarius, glad you liked it. A nice short romp. I think it took ~3 hours (I wasn't tracking precisely). Beautiful and atmospheric snow scape (I have more real snow outside, so appropriate timing). I really like the equipment stripper, level up, equipper at the beginning. Makes it so you have appropriated gear for the module instead of overpowered gear from somewhere else. I built a Fighter/Rogue/SD and he was a great bounty hunter. Like him so much thinking about playing him in Swordflight 3 instead of continuing other character. A short one like this appreciated. It took me forever to finish Swordflight 2. I got well into it, then had to put it aside, then forgot most of it, so I had to start over. It was starting to feel like work. I think I may holdoff on SF3 until I feel I have a lot of contiguous time. I think I would prefer 3 connected 10 hour modules to one 30 hour module. Thanks for commenting on the module, Snowdog, glad you liked it. I cannot deny that Swordflight is ridiculously long. Unfortunately given the non-linear structure of Ch. 2 it would not have been very practical to break it up into sections. Wonderful module! Absolutely loved it! Loved the atmosphere, loved the story, even though it was short. The author clearly put a lot of effort into this module! I look forward to playing the author's other modules. Played with a 13th Level Elven Wizard,. The battles were perfectly balanced. There were no bugs in this module. Thanks so much rogueknight333 for the amazing module! Thanks for the vote and generous praise, thebffl. I am pleased you found this little module so enjoyable. Nice short module, especially given the time constraints. Had there been none I'm sure it could have been even better. A thing I did not expect though was the overall jovial music, especially when going deep within that forest and such. IMO it does not fit well the whole winter/isolation/hunting for the killer theme, I would have expected something more dark and pressing, and this somehow broke the effect for me. I just watched the movie Revenant a few days ago, and while walking deep north into the wintery snow I stumbled upon this guy. Both the face and description and setting in which I encountered it (heavy winter far up north, hunting for a killer) reminded me of the character played by Di Caprio. Funny coincidence. Thanks for the comments vee6. I do not even remember offhand what music I was using in those areas, probably one of the standard Bioware tracks for forests or snowy areas, so it may well not have been the best choice. And, yes, that similarity to the Revenant movie is indeed a funny coincidence: obviously given the release date of this module I could not have planned it. The book came out in 2003 and I was curious if you had read it by chance, but I don't know about how much it coincides with the movie tbh and in my mind I was comparing it to the movie. Anyway, looking forward to playing your other modules. I'm looking at Swordflight but as I understand the series is not finished yet, so I'll wait with that one a bit. Keep up the good work! I had not read it or had any knowledge of that book, so indeed any resemblances between it and the module are purely coincidental. Be aware that the Swordflight series is ridiculously long and it will be some time before it is complete, though I am working away at it. I played this a few months ago, so it's not *that* fresh in my mind, but I can say without a doubt that I absolutely loved it. With great atmosphere and amazing encounter design and itemization, this truly felt like a grim journey into the harsh and unforgiving northern wilderness. The main quest, despite its simplicity, motivates you to keep pushing forward against the savagery of the land and its inhabitants, stalking a foe that you feel might, in the end, prove too elusive to capture... or might already be dead. Thanks for the vote and enthusiastic comments, Lorfean. I appreciate it. Very nice short module with some unique touches. I liked the Orc Riders! Well done. Thanks for the vote and comments. I read about this mod on RogueKnight333's Swordflight page, I believe. Since I have been throughly enjoying that mod, I figured that I would give this short adventure a whirl. It also seems to be highly recommended by the community.. Being a working Mom/Grandmother, I sometimes do not have the time to invest in lenghty mods. And when I do and real life comes about, I forget the storyline, lose interest, or end up restarting a new character. I have read some reviews on this page condemming this mod for it's shorter length. I do not believe that this is fair. The lenght of a mod should not matter as long as it is well done. As stated above, sometimes adults do not have as much time as they would like to invest in longer quests. Based on what I have seen of RK333's other work, I have no doubt that this will be a great mod as well. Thanks for the comments, Raevyn. As one can see from Swordflight, my natural instinct is to get carried away and make ridiculously long series. Given the nature of the challenge that gave rise to this (make a module in one month) I had no choice but to make a short one, but as you suggest that might be just as well as there is doubtless a market specifically for short modules.